What a fun night I had with my brother and his family at the Harlem Globetrotters game at the Prudential Center. I grew up watching Meadowlark Lemon and Curley along with the other Globetrotters performing on television. I was always so mesmerized by their ability to spin the basketball on their finger and roll the ball across their bodies. I loved the water bucket skit. It always left me laughing until I was in tears. 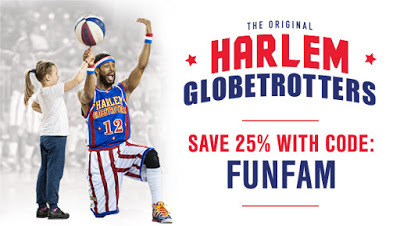 Today's Globetrotters are just as entertaining and enjoyable! The team kept the audience engaged and entertained with their funny skits, great humor and phenomenal skills! I was so impressed with their agility. They make the trick shots look so easy. Of course, we cant forget about Big G who had everyone laughing with his center court performance as well! Of course the best part of the night was the Globetrotter victory! After the game, all fans were permitted on the court for autographs and to meet the players. The Globetrotters are coming to an arena near you!! Every game will showcase incredible ball handling wizardry, rim-rattling dunks, trick shots, hilarious comedy and unequaled fan interaction. You won't want your family to miss it - use promo code FUNFAM to save 25% off your tickets. That is HUGE savings for you and your family! While you are on the site, be sure to get yourself familiar with all of the players, watch videos, check out their community involvement and more! Disclosure: I am a member of US Family Guide and received tickets to attend this event. All opinions expressed are my own.